First things: I am not using the overlays feature of InDesign. It is not possible to add scrolling text fields in a reflowable ePUB, but with the fixed layout format we can add a text box on a page and include (almost) as much scrolling text as you like. 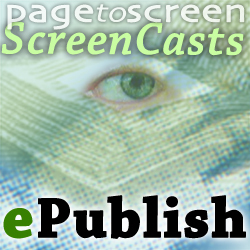 Here are the instructions to create a vertical scrolling text for the ePUB(Fixed Layout). We can add a few compleling details to our fixed-layout eBook. Animation and image sequences are useful additions. We know that we can add multimedia (audio and video) to our reflowable eBooks, but in this screencast we add audio that is invoked when we click or touch an object. If we are keen to add video, then we show how to change the poster image from another location within the video. Note: The recipes and some content in this sample eBook work is NOT my own and I am only using for demonstration purposes. We did the reflowable recipe book, now lets look at the fixed-layout options. We have already been through making a reflowable eBook; digital native, no intention to make a print version. This meant that we worked in InDesign on single pages, no spreads, and we set the pages up to simulate an iPad view of the finished eBook. If we now want to consider the fixed-layout version, what are our options for this format? Now we have created seperate IDML files from InDesign we need to import these into an iBooks Author template. We need to understand something about the structure of an iBooks Author file and how this relates to the structure of the content we have in InDesign. This screencast is almost 30 minutes long.... sorry! iBooks Author provides some ways to get content from InDesign. The best way is to export from InDesign to the IDML format but we need to do this section by section. This first screencast episode shows you how to divide the InDesign file into separated files using a couple of scripts. When we place audio on the page of a fixed-layout eBook, we cannot expect it to contiunue to play when the page is turned. Simply, each page is a new XHTML document, so audio (or any media) will stop on leaving that page. If we want to get audio to continue to play as we turn the pages, we need to modify the markup inside the ePub package after we have exported from InDesign.